Luke plunges into visionary tales of the impossible and people who, to one degree or another, expressed doubts, reservations, and fears, and felt themselves unqualified for the task. 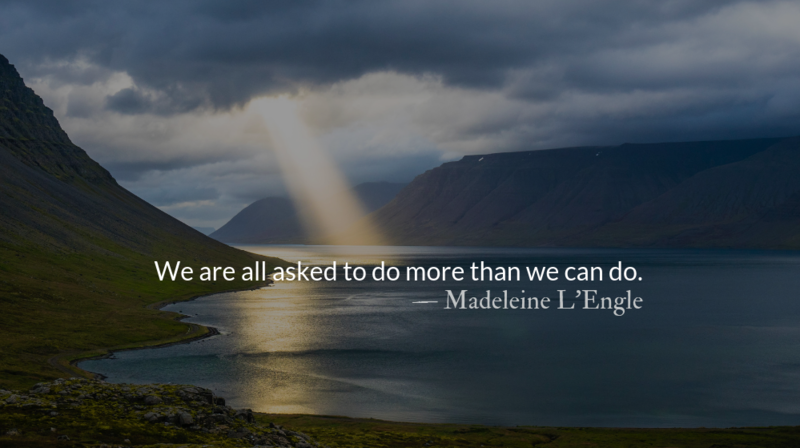 Madeleine L’Engle, in her book, Walking on Water marvels at how often God gave glorious visions and impossible tasks to those who were ill equipped. “We are all asked to do more than we can do. Every hero and heroine of the Bible does more than he would have thought it possible to do, from Gideon, to Esther, to Mary. Jacob, one of my favorite characters, certainly wasn’t qualified. He was a liar and a cheat; and yet he was given the extraordinary vision of angels and archangels ascending and descending a ladder which reached from earth to heaven. God’s chooses to do the impossible with the unqualified, to frustrate the wise with the foolish, and to overthrow the strong with the weak. He subverts the systems we rely on and reminds us that our competence is an illusion and his grace shown through us comprises all that is good in the world. We face the impossible, like Zechariah, when the world sees us as cursed and broken. We face the impossible, like Mary, when the world strives to keep us powerless and vulnerable. In the face of the impossible we are forced to keep our faith where it always should have been—on God. We are not qualified, but, L’Engle concludes, God will be glorified. Like all who lived and died.